Asiatic Pheasants China - 915 items found. Print a little hazy and there are a few glazing blemishes but overall good. Depth of blue varies a little from plate to plate. Typical blue printed backstamp with Adderleys Ltd, plus impressed date mark for 1924. 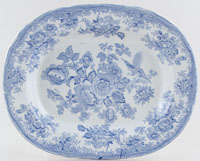 Oval dish impressed with the date for December 1886. This is an attractive dish although the surface is fairly mottled in places and has quite heavy knife marks. The rim also shows signs of wear. 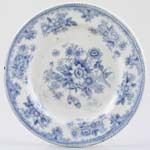 Unusually this is an oval meat dish in Asiatic Pheasants, made by the famous G L Ashworth & Bros (Masons) of Hanley, Staffs. 1862-1968. Three stilt marks to face and few glaze blemishes on back, but gorgeous condition. Impressed mark ASHWORTH and date 9:86. Fabulous large pie dish. Backstamp: Impressed Ashworth 518. Some surface scratching and signs of wear but overall very good. Lovely footed cheese stand printed in this pretty pale blue pattern. Backstamp: G L A Bros and impressed Ashworth. Crazed with some light surface scratching. It has a very small black mark to the rim and another tiny stain, but overall excellent condition. Small plate. Backstamp: Asiatic Pheasants Barker Bros Longton. Surface scratching and some wear on the back and a little to the outer rim. There is some blue smudging and small stain to the face. It is beautifully hand made being not quite level! 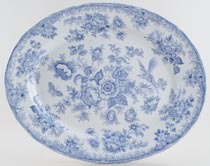 Very pretty platter with wavy rim. Backstamp: Asiatic Pheasants B & K. Some surface scratching, light crazing, some bubbling of the glaze and a little discolouration to the stilt marks. As usual sounds much worse than it looks. 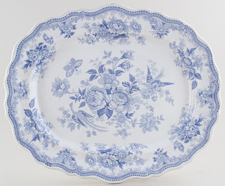 Plain rim platter, although the application of the border pattern gives the appearance of a wavy rim! Backstamp: Asiatic Pheasants B & K Ltd. A little surface scratching and the occasional manufacturing blemish, overall excellent condition. Wavy rim platter with crazing and some light patchy associated staining. Lovely small or medium dish. Blue slightly darker than some and slight ghosting of the blue print. The first flow blue Asiatic Pheasants? Only joking. A pretty piece and modest size ideal for display. Blue printed backstamp. Good condition. Backstamp: Asiatic Pheasants B & K Ltd. Visible stilt marks but face clean and bright. 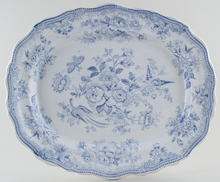 Lovely plate with wavy rim and soft transfer. Minor wear to the rim. 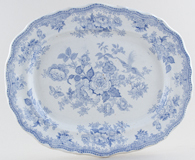 Lovely plate with wavy rim and soft transfer. Pretty wavy rim plate with soft transfer. Large wavy rim plate. Backstamp: Asiatic Pheasants JB Fine all over crazing with a little discolouration to the outer rim and just a touch on the back. Overall a lovely large plate. James Beech. A lovely stand on a round foot. It is crazed with some associated staining. 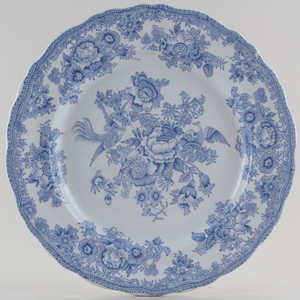 Blue printed backstam JB Asiatic Pheasants . Lovely wavy rim platter printed in a soft pale blue. Backstamp: Asiatic Pheasants Jabez Blackhurst. Crazed with just a little discolouration and surface scratching and touch of wear on the back and to the outer rim. Lovely wavy rim platter. Backstamp: Asiatic Pheasants B & D. Light all over crazing with a little discolouration and loss of glaze to the stilt marks and also to the rim a small piece of excess clay. On the back just a little wear. Lovely dish with wavy rim. The initials B & D, which appear as the maker's mark, have not been previously identified. We have attributed them to Blackhurst & Dunning of High Street, Tunstall, who were active in the 1860s and there were other Blackhurst partnerships, which made Asiatic Pheasants. Backstamp: Asiatic Pheasants B & D. Light all over crazing with just a hint of discolouration otherwise excellent condition. Lovely wavy rim dish. Backstamp: garter mark with Warranted Staffordshire and TB & Co. A little surface scratching and touch of wear to the outer rim, also to the rim a very very small firing fault. Overall excellent condition. Am attractive oval vegetable dish on a raised oval foot. This is a quality piece and well printed. The glaze is sound and overall in excellent condition. Blue printed garter mark with Warranted Staffordshire and TB & Co for Thomas Booth & Co of Burslem and Tunstall, active 1868 to 1872. TG & F Booth of Tunstall. Matt in appearance probably due to a heavy work load throughout its life! Some staining around the rim and shaded discolouration to the face. Lovely wavy rim plate. Backstamp: TG & FB Warranted Staffordshire. Some surface scratching with discolouration to the outer rim and a little also on the back. Lovely little piece with wavy rim and moulded side handles. Backstamp: Asiatic Pheasants B M & T. Light all over crazing with a little wear to the outer rim, overall excellent condition. Small wavy rim platter. Fine all over crazing with a few areas of minor light staining. Blue printed backstamp: E.B. & J.E.L.